Vladimir Terasenko is currently one of the hottest players in the NHL, so when I had the opportunity to get my hands on an autograph of his at a very reasonable price, I jumped at the chance. Especially considering that the card companies have given up on him sending back his autographed cards to fill redemptions, his signature can be a bit tough to come by. 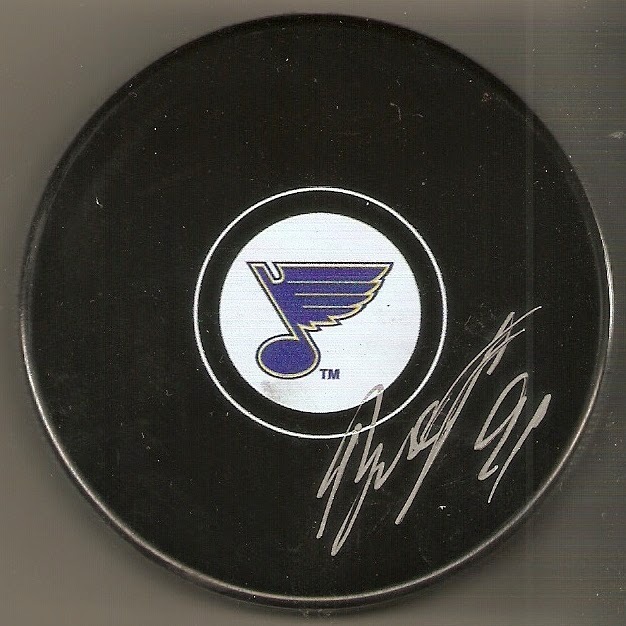 St. Louis Sports Collectors was conducting the signing, and while I was nowhere near that location, they did take orders, and were even able to provide the puck, which was perfect for me. Now, they didn't have the quickest turnaround time, but a couple weeks later, a white box showed up in my mailbox and I now have this great item in my collection.